Close, fast, thrilling. The Grand Prix de Rouen of 1970 and its F3 support race could have been described as all those things. Unfortunately three other words would also describe the races: Dangerous, Damaging and Fatal. While the more experienced competitors in the F2 race were able to turn the extremely fast slipstreaming of Rouen into an astonishingly close, but clean celebration of everything great about the circuit, the less experienced F3 competitors fell prey to its dangers. Three separate incidents cost the lives of 2 drivers, while another was badly injured. These events totally took the gloss off the exciting F2 race, and raised further questions on the safety of what was one of the fastest tracks in Europe. It was to be the blackest day in the history of the circuit. Round 4 of the European F2 Championship was held one month late, after the original dates of May 30/31 had been changed following the cancellation of the Reims round… that great circuit closing its doors for good. There was much criticism of the unguarded pit area, but that would be fixed by the construction of a new Autoroute, meaning a new pit area would need to be built for the following season. The 1967 winner, Jochen Rindt, was favourite once again, arriving in his works Lotus 69 with team-mate triple world champion Graham Hill in the sister car. Brazilian rising star Emerson Fittipaldi was there in his Bardahl 69, and further 69s were entered for Japanese driver Tetsu Ikuzawa and 1968 Rouen F3 winner Adam Potocki, who had had little to celebrate since that surprise win. Brabhams were as usual the most popular cars in F2, and there were a number of BT30s arriving. Jack Brabham turned out in a Coombs example, while Barcelona winner Derek Bell arrived in his Wheatcroft-run BT30. Sports Motors Team Brabham arrived with Brabhams for Tim Schenken and François Mazet, while two Argentinean YPF Oil BT30s were entered for Carlos Reutemann and Benedicto Caldarella. Andrea de Adamich, John Watson, Graham Birrell, Peter Westbury, Henri Pescarolo and Jean-Pierre Jassaud rounded out the Brabham entries, Jassaud back in F2 for the first time since his horrifying accident at Monza in the 1968 F2 event there which almost cost him his life. France was well represented for the weekend, two Pygmee MDB15s being entered for Jean-Pierre Jabouille and Patrick Dal Bo by the works team and two identical cars for Patrick Depailler and Jean-Pierre Beltoise. BMW also entered a four-car team, with brand new cars for Swiss Jo Siffert and 1968 Rouen F1 winner Jacky Ickx and 1969 examples for Germans Hubert Hahne and Dieter Quester. Tecno were hotly tipped to arrive with new cars, but unfortunately only two 1968 models were in attendance for Clay Regazzoni and Francois Cevert. The works March team arrived with 702s for Ronnie Peterson and team owner Malcolm Guthrie, Tino Brambilla elected not to bring his Ferrari Dino and so the final entry was Reine Wisell in a lone Chevron B17C. The biggest question before practice was would rear wings be required? 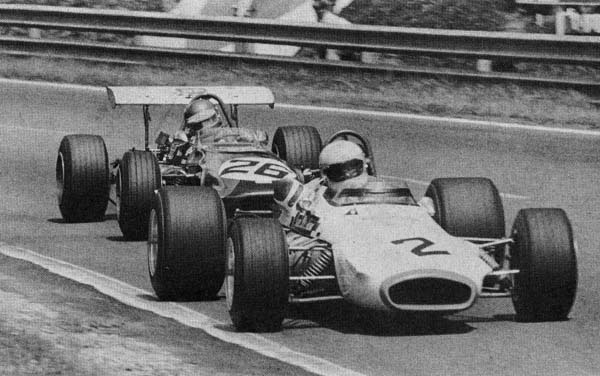 There was no previous experience to go on as this was the first F2 race at Rouen since 1967, when of course there were no rear wings. Would they retard the speed on the straights or would their provision of extra grip on the corners allow for faster speeds? Time would tell. The opening practice session was held in perfect weather on the Thursday. Regazzoni was the only one to get under Rindt’s 1967 record with a 2m 2.5s time, while Schenken was credited with a 2m 2.6s despite having a persistent misfire. The real 2nd fastest then was Rindt himself on 2m 2.9s, while the second works Lotus remained off the circuit with its driver Hill not arriving until Friday. Ickx, Peterson and Beltoise all managed times under 2m 4s, Peterson struggling with a number of problems throughout the session. Beltoise was the only Pygmee driver having a trouble-free time of it, Jabouille had gearbox problems and could manage no better than 2m 6.3s, Depailler was even slower on 2m 7.6s, while Dal Bo had a nasty moment when a bolt dropped out of one of the rear radius rods, sending his car into a terrifying spin. Luckily, he managed to keep the car out of the scenery. Westbury was quickest after Beltoise, from the impressive Watson, making his debut at Rouen, and Bell. Brabham was next from Jassaud and Fittipaldi, who was struggling with the lightning fast corners. Reutemann was having the same problem and was way back on 2m 7.6s, and team-mate Caldarella was having an even worse time of it, 8 seconds off the pace on 2m 10.7s. Ikuzawa and Siffert were in the 2m 5s bracket, Wisell on 2m 6s, Birrell, de Adamich and Mazet on 2m 6.7s, and Cevert just behind. Hahne was very slow with engine problems, Guthrie was struggling with his clutch and Pescarolo required a gearbox change after recording a 2.5.5s time. Peterson was the star on day two, equalling Regazzoni’s Thursday time to be fastest of the day. Siffert, now running the streamlined body on his BMW, was just 0.1s slower. Rindt managed a 2m 2.6s time, but team-mate Hill had a problem with a flat tyre, possibly caused by a stone from the paddock. Schenken’s BT30 had shrugged off its misfire to settle into the 2m 3s bracket, along with Bell, the improving Fittipaldi, Westbury, de Adamich and Cevert. At this point Watson was struck down by bad luck. He suffered a puncture at the flat out Grésil, the car turning hard left into the barrier and destroying itself. Watson was perhaps fortunate to escape with a broken leg and broken arm, as his injuries could have been far worse. Jabouille, Ickx and Jassaud all got under 2m 5s, as did Mazet despite losing his rear wing at one point. Pescarolo had his starter motor fail almost immediately and so could not set a time, while Brabham couldn’t get any heat into his tyres and he failed to improve on his Thursday time. Quester, Depailler, Caldarella and Wisell all improved to be above 2m 6s, while Hill suffered a head gasket failure to add to his earlier puncture and was way back on 2m 6.3s. Birrell was just ahead of Hill, while Reutemann and Hahne were just behind. Guthrie managed a 2m7.7s time, Dal Bo a 2m 9.2, and rounding out the field was a very slow Potocki. Early heavy rain cleared in time for the first 15-lap heat. Only the top 5 from each heat would qualify, plus the four next fastest times from each. Eleven would miss out, and with such a strong field some good drivers wouldn’t make the cut. Siffert got away best in Heat 1, and as they completed lap one Peterson and Siffert were side-by-side with a small gap to Fittipaldi, de Adamich, Bell, Westbury, Brabham, Hill, Jassaud, Depailler, Wisell, Hahne and Guthrie, with Potocki already well behind at the back. Peterson had got by for the lead at Nouveau Monde, and soon Fittipaldi was past Siffert as well. The two of them began to pull away from Siffert until lap 4 when Fittipaldi’s crankshaft broke and he limped off into retirement. 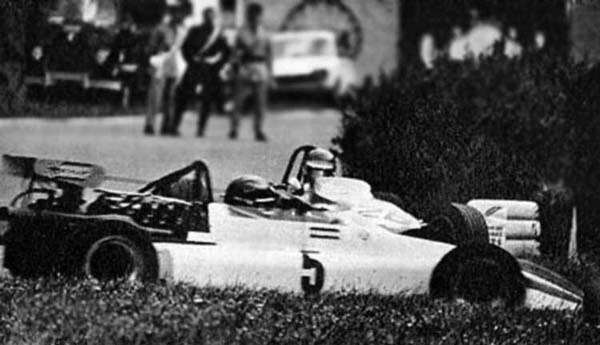 Joining him in early retirement were the very slow Potocki on lap 2, Hahne with a blown engine on lap 5 and Jabouille on the same lap with a broken front anti-roll bar. Brabham meanwhile had got by de Adamich, Bell and Westbury and by lap 8 had closed up on the leading two, and Hill had caught Jassaud and Depailler by lap 10. Brabham actually had his nose in front as the front three completed lap 10, but Siffert’s superior straight-line speed told in the end, and he took the flag from Peterson and Brabham. Bell and Westbury were next, while Wisell was unlucky with an engine problem at the end which cost him a chance to pass Westbury for 5th, and he slipped behind de Adamich to finish 7th. 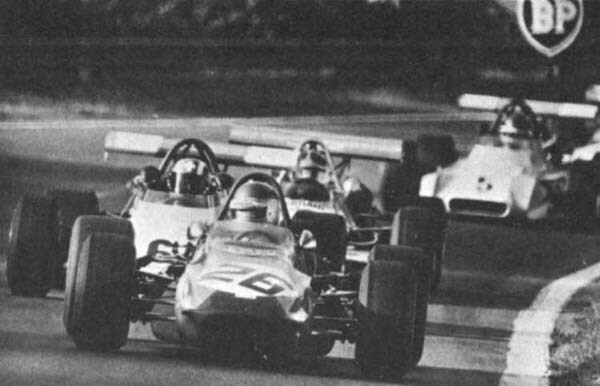 Hill wound up 8th after getting past Jassaud and Depailler, while Guthrie brought up the rear. Peterson set the fastest lap of 2m 2.1. Schenken roared away from the line first in Heat 2, with Regazzoni right behind him. But by the end of the lap Regazzoni had assumed the lead, and Rindt had got past the Australian as well. Next came Cevert, Ickx, Ikuzawa, Beltoise, Pescarolo and Mazet, followed by Quester, Dal Bo, Reutemann, Caldarella and Birrell. Rindt hit the front on laps 4 and 5, and at the same time Cevert came into the pits complaining of strange steering. Nothing untoward was found, and he was waved away, now a lap down. However all was not lost, as he now had a clear track in front of him and could concentrate on setting a very fast time to make the final. Cevert didn’t need to worry, as suddenly cars started stopping left, right and centre. Dal Bo was the first, like Cevert complaining of strange steering, and two laps later he retired. Birrell broke a piston on the same lap, and a lap later Caldarella brought his smoking Brabham into the pits to retire with a blown engine. Beltoise’s gearbox failed him, while Mazet succumbed to engine gremlins. Quester called it quits on lap 8 with no brakes, leaving just 8 runners, including Cevert a lap down. Regazzoni had meanwhile got clear of Schenken and Rindt, and things looked grim for Schenken when he headed for the pits on lap 9. Luckily for him, his fuel pump problem was fixable, and he resumed 2 laps down. Reutemann prospered from the misfortunes of others to claim 3rd, ahead of Pescarolo, Ikuzawa and Ickx, with Cevert and Schenken 1 and 2 laps behind at the end. 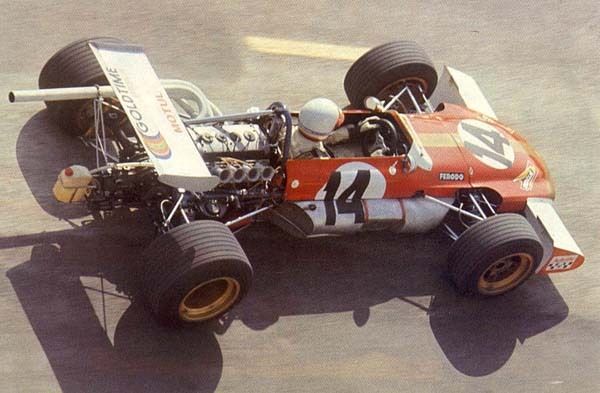 Besides Jackie Stewart, a stronger field could not have been wished for, for the running of the 25-lap Final. Siffert once again got away from the line best, leading Regazzoni, Rindt, Pescarolo, Brabham and Bell. Siffert and Regazzoni had broken clear by the end of lap 1, Pescarolo, Rindt, Brabham, Bell, Ikuzawa were in the next group, along with Fittipaldi who had an engine change during the heats. Peterson had made a poor start and was next, just ahead of Cevert, Ickx, Wisell, Westbury and Mazet. De Adamich was struggling with high engine temperatures but was still keeping ahead of Reutemann and Jassaud. Regazzoni grabbed the lead from Siffert on lap 4, but despite a lap of 2m 3s Rindt could not keep up with the two Swiss drivers and began to be sucked into the chasing bunch. Brabham upped his pace with a 2m 2.6s, before Cevert managed a searing 2m 2.1s lap as the pace heated up. Pescarolo’s car couldn’t handle it though, the Frenchman force to park with a blown head gasket at Grésil. The chasing bunch began to close on the lead pair, while Wisell had detached himself from the battle between Mazet, Ikuzawa and Westbury. Ikuzawa then retired on lap 10, with his car refusing to spin above 8000rpm on the straights, thus leaving him very underpowered. Cevert joined him soon afterwards with a blown head gasket. Shortly after half distance Siffert and Regazzoni had been joined by Fittipaldi, Schenken, Brabham, Peterson and Ickx. Rindt meanwhile was starting to have engine problems, and dropped into Bell’s path. Soon afterwards he waved Bell past and soon was being caught by Wisell and Westbury as his struggles continued. Mazet had also dropped back, ahead of Reutemann, Jassaud and de Adamich who was still struggling along. 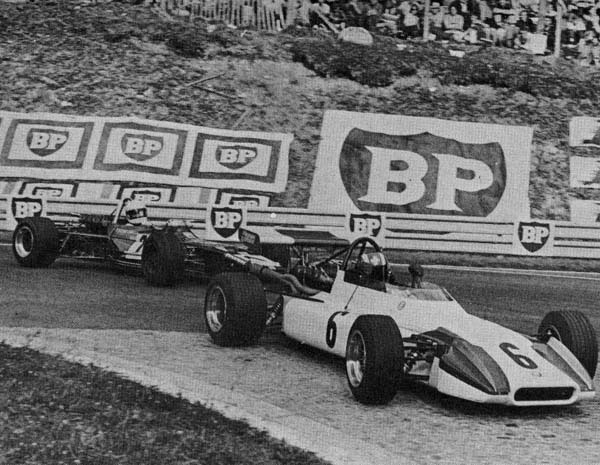 The lead continued to change by the lap, with March F1 team-mates Peterson and Siffert appearing to be holding a private battle despite the large bunch of cars surrounding them, the fastest lap coming down lap by lap. Peter son had the lead beginning the final lap but in his attempts to go even faster, he locked the rears and spun at Nouveau Monde, letting the whole bunch through. Siffert was home free and duly crossed the line just ahead of Regazzoni, with Fittipaldi, Ickx and Schenken next. 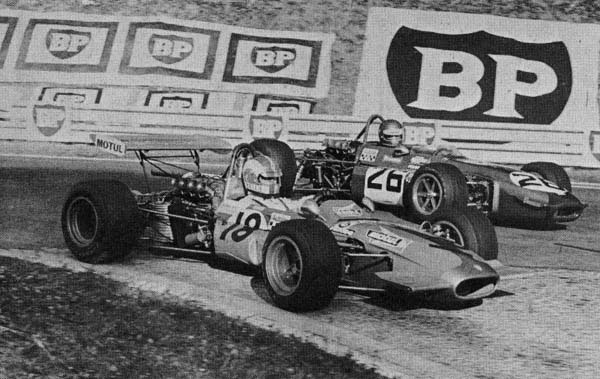 Peterson had recovered from his error and had got back past Brabham and Bell on the final half-lap. The final eight were covered by just 2.4s at the chequered flag! Rindt held on for 9th, just ahead of Westbury, Mazet came home 10th ahead of Reutemann, Jassaud and finally de Adamich who had to back right off at the end as his car threatened to expire. 34 cars turned up for the F3 race, with most of the top drivers present. Seven Brabham BT28s arrived; Gerry Birrell in the Sports Motors car, Montlhéry winner Mike Beuttler with the Clarke-Mordaunt example, Richard Scott and Cyd Williams in privateer Brabhams, Brendan McInerney in the RCI car, and the rest were driven by Alan Harvey, David Purley, the fast but inexperienced Bob Wollek, and Ulf Svensson. Tecnos were brought out in force also, with Jean-Pierre Jassaud and Jean Max in Tecno-powered examples, while François Migault, Jean-Pierre Jarier, Alan Franceschi, Peter de Meritt, Cliff Haworth, Freddy Link, Lionel Noghes, Etienne Vigoureux, Bernard Plaisance, Max Bonnin and Alain Boudier all had Novamotors in their Tecnos. A pair of Lotus 59s turned out in the hands of Wilson Fittipaldi and Andy Sutcliffe, while James Hunt and Freddy Kottulinsky had older versions of the 59. Martini entered a MW5 for the rising star Jean-Luc Salomon and an older MW3 for Jimmy Miusset, while Peter Gaydon arrived in his Brabham-esque EMC. Barrie Maskell brought a Chevron B17, and Jörg Dubler had a similar car. Formula France champion Denis Dayan had his Grac MT11 with him, Jean-Claude Guenard brought along an Alpine-Nova A360, while last but not least was the Kitchener K2 of Rene-Pierre Alie. To get a good time in an F3 car at Rouen you needed a good slipstreaming car. Salomon set a very fast pace on Thursday with a 2m 18.1s time, 0.9s clear of Guenard’s Alpine on 2m 19s, with Birrell, Migault, Wollek, Dayan, Beuttler, Dubler, McInerney, Scott, Jassaud, Svensson, Williams and Harvey all under 2m 21s. Maskell and Purley both managed 2m 21s, Fittipaldi, Miusset, Gaydon and Franceschi all managed 2m 22s times, while Hunt, Link and Kottulinsky finished in the 2m 23s. Jarier broke a driveshaft and so was well back, Bonnin broke a nosecone in a small collision with Salomon which caused him to miss most of the session, while Noghes, Vigoureux, Alie and Sutcliffe all had problems and failed to set decent times. Scott was the star on Friday, recording a blistering 2m 17.7 time, with Wollek just 0.1s behind him in 2nd. Birrell, Williams and Dubler all did sub-2m19s times, Williams’s effort all the more noteworthy when you consider his right arm was in plaster and causing him a lot of pain! Jarier recorded a 2m19s time as did Harvey before his head gasket blew. Guenard, Jassaud, Migault, Dayan and Salomon were next, Beuttler had camshaft problems and so didn’t improve his time, and Hunt, McInerney, Purley and Kottulinsky got into the 2m 20s. Svensson’s time from Thursday saved him after he holed a radiator, while Max, Gaydon and Fittipaldi rounded out the qualifiers. Purley as first reserve missed out despite his speed, while Miusset, Bonnin, Vigoureux, Maskell, Boudier, Haworth, de Merritt, Noghes, Franceschi, Link, Sutcliffe, Plaisance and Alie all prepared to watch the race from the grandstands. An exciting race was in prospect, with any of the 20 runners capable of winning, and the nature of the circuit meaning it would be difficult for drivers to break away. This all added up to a thrilling, but potentially extremely dangerous event on such a narrow track. Scott got away well from pole, but had the pack bearing down on him, and Hunt at the back after a half spin at Nouveau Monde. So close was the racing that it was never really possible to pick out a leader, with the cars passing the timekeepers in 3s at times. Max however was the first to retire, with gearbox problems on lap 1, and Harvey blew his engine on lap 3. McInerney came into the pits to have his nosecone checked on lap 6, he resumed last. Dubler retired on the same lap with a broken rocker arm, while Gaydon called it a day after somewhat bizarrely being scalded when his radiator cap came loose. So 15 were left fighting it out, and fight it out they did, positions changing regularly. Something had to give, and it did, tragically, on lap 13. Denis Dayan had been right amongst it, but on the downhill plunge to Six Frères he suffered suspension failure at over 120mph. Out of control, the Grac hit the barriers head-on. The barriers collapsed under the impact, and poor Dayan was fatally injured, the Frenchman succumbing to chest and arm injuries in hospital two weeks later. Soon afterward, the race was further marred by another enormous accident. As the cars sped down the back straight towards Scierie, someone elected to try and pass the car ahead without checking his mirrors. James Hunt tried to take evasive action, and Bob Wollek struck the rear wheel of his car. Wollek's car was thrown into the air, and it somersaulted into the trees. Wollek was pulled from the wreckage with serious chest and arm injuries, and for a while it appeared he would not pull through. Thankfully, however, he did recover, and would race at Rouen again in the coming years. The impact broke Hunt’s exhaust, but he was able to continue as the battle raged. With 5 laps left, it looked like Fittipaldi, Beuttler and Salomon would break free from the rest, but one lap later the bunch had closed right up again, led by Birrell with Williams, Kottulinsky, Svensson, Hunt, Scott, Migault and Jassaud right behind him. Guenard lagged well behind after an unscheduled pit stop. Into the final lap and it was anybody’s race. Hunt took the flag after a frenetic last lap, just beating Fittipaldi and Beuttler home, but just behind them there was pandemonium, and regrettably, another tragedy was unfolding. Those who saw the incident claim that Salomon tried to force his way through the cars in front of him as they screamed down the main straight for the final time. His car touched Kottulinsky’s and was launched into the air, landing upside-down on Kottulinsky’s car in the roadside ditch. Scott, Birrell and Williams all touched in the resulting melee, Scott’s car finishing up badly damaged in the barbed wire fence, while the other two finished up in the ditch. All three emerged unhurt. Jassaud, Migault and Svensson managed to pick their way through to take the flag, while the others stopped to try and get Salomon out of his car. It was too late though; Salomon had suffered severe head injuries and he died soon afterwards. A tragic end to a tragic race, and the blackest day in Rouen’s turbulent history.